Truth be told, there is no new technology. Today’s bats are still made from English willow, and must have a cane handle. I had the opportunity this week to meet Paul and Sally Bradbury at their bat factory in Fremantle. The pair have been manufacturing cricket bats for over 20 years. The Bradburys make all their bats locally, a rarity in this country. “We were a little perplexed,” Paul Bradbury said in response to comments about new technology in bat-making. “I don’t think there’s been any technical changes come along in our time, unless we’ve missed a trick. There have been certain trials that have come into the game over the past two decades that have since been outlawed at the top level. Kookaburra released a graphite reinforced bat during the late noughties. Players have tried laminating the face of their bats, as well as jamming cork inside them – a method borrowed from baseball – to provide more spring. The MCC doesn’t allow any inserts in bats, or anything other than a cane handle. The biggest change in bat manufacturing over the past decade is the size of the edges and the weight. “When we first started, all the top players were interested in was the size of the back of the bat,” Paul Bradbury said. “Alex Stewart, the first thing he would do was measure the size of the swell, the sweet spot. Edges weren’t even considered. “In 2004 we experimented with a flat-faced bat, which was a Duncan Fearnley idea. That meant the edges could be a lot bigger because you didn’t have to lose willow on the face of the bat. Bat weights have significantly increased over this period as a result. When Bradbury first started making bats for the professionals, they would ask for bats weighted between 2.6lb and 2.8lb. Former Australian cricketer Ryan Campbell requested a 2.4lb bat when he first broke into the Western Australian team. The pros nowadays generally use anything between 2.9lb and 2.11lb. Chris Gayle and Sachin Tendulkar use bats as heavy as 3lb. 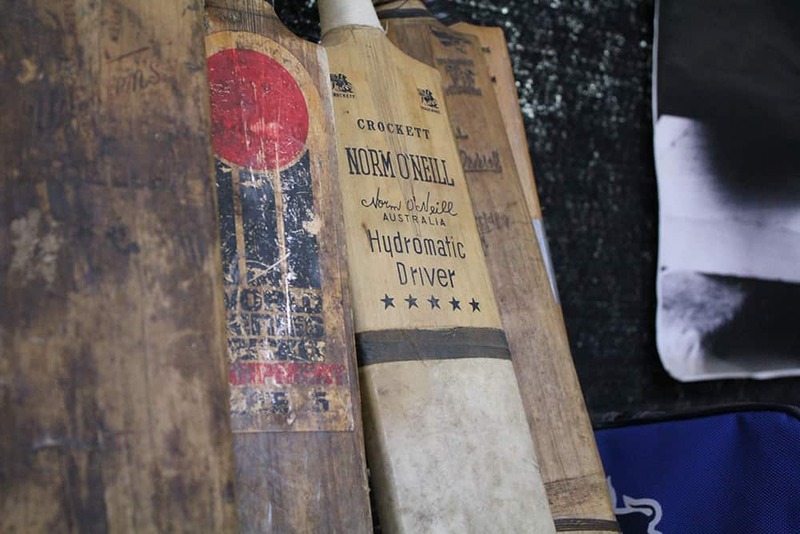 Bradman used a 2.3lb bat, for perspective on just how far we’ve come. Having initially started manufacturing bats in the Apple Isle in 1993, Paul Bradbury came across an 18-year old Ricky Ponting. “I’d heard of this young guy and he’d already scored four Shield hundreds against WA at the time,” Bradbury said of Ponting. “At fielding practice he was the best, we’d be in the nets trying to survive against a bloke like Troy Cooley and he’d bat like he was batting on ice. The Bradburys started their bat-making at the same time Ponting’s professional career began. Paul and Sally made his bats for a large portion of his career. More so than any other player, Bradbury says Ponting has always been closely interested in the design of his bats.